Paired synovial tissue samples were obtained from both clinically uninvolved (CU) and clinically involved (CI) knee joints of eight rheumatoid arthritis (RA) patients. In addition, biopsies were taken from five control subjects. We observed the expression of the chemokines CXCL8, CXCL9, CXCL10, CCL2 and CCL4 in CI and CU joints of RA patients. In particular, CXCL8 protein levels were specifically increased in CI joints compared with CU joints, which was confirmed by immunohistochemistry and in situ hybridization. Rheumatoid arthritis (RA) is a chronic inflammatory disease of unknown etiology affecting diarthrodial joints. Macrophages are major components in the inflammatory cascade [1,2] and are also believed to be important mediators of joint destruction [3,4,5]. Large numbers of macrophages are present in synovial tissue (ST)  and their cell numbers are associated with scores for local disease activity in clinically involved (CI) joints of RA patients . Interestingly, increased numbers of macrophages can also be observed in clinically uninvolved (CU) joints of RA patients, although their number is lower than in CI joints [8,9]. The observation that macrophage numbers are increased in joints that are still clinically quiescent could be explained by a difference in functional activity between macrophages in CU joints and in CI joints [2,10]. Macrophage activity in the synovial compartment includes the production of chemotactic cytokines called chemokines [11,12]. Chemokines can be generally divided into four groups: the CXC, C, CX3C and CC chemokine receptor families . The CXC subfamily includes CXCL-8 [interleukin (IL)-8], CXCL-9 [monokine induced by γ-interferon (Mig)], and CXCL10 [interferon-γ inducible protein-10 (IP-10)]. The best-studied chemokine of this family is CXCL8, which is produced constitutively by macrophages in the synovial compartment  and is capable of inducing synovial inflammation in an animal model . CXC chemokines are mostly chemotactic factors for neutrophils , although CXCL10 and CXCL9 attract monocytes and T lymphocytes . The CC chemokines include CCL2 [monocyte chemoattractant protein 1]  and CCL4 [macrophage-inhibiting protein-1β (MIP-1β)] . The main function of both CCL2 and CCL4 seems to be the recruitment of macrophages [19,20,21]. To investigate the role of chemokines in relation to clinical signs of synovitis, we determined chemokine expression in paired CU and CI RA knee joints. Eight patients with RA (ACR 1987 criteria ) and both a CI and a CU knee joint were investigated. The knee was considered uninvolved if the patient noticed no pain or limitation of range of motion and two independent observers could not detect signs of inflammation such as swelling, warmth, effusion, or pain on examination. The knee was considered involved if there were signs of inflammation, namely joint effusion, synovial swelling, and pain. Five subjects without inflammatory joint disease and meniscus pathology served as control subjects. All patients gave informed consent, and the Medical Ethics Committee of the Leiden University Medical Center approved the study protocol. The mean ages were similar for patients and controls. The mean disease duration of the RA patients was 73 months (range 3–252 months). Most RA patients had active disease in other joints in addition to the knee joint from which the synovial biopsies were obtained. The mean Ritchie articular index  was 11 (range 3–24) and the mean serum level of C-reactive protein (CRP) was 69 mg/l (range 4–108 mg/l). In six of the eight RA patients the CU joint had shown clinical signs of arthritis at previous phases of the disease. In all RA patients an arthroscopy procedure was performed in both knees with a small-bore 2.4 mm arthroscope (Storz, Tuttlingen, Germany) by a single skin portal in the suprapatellar pouch both for macroscopic examination of the synovium and for the biopsy procedure. At each arthroscopy, synovial biopsies were taken from the supra-patellar pouch, the synovium–cartilage junction, the patellar gutters, and the tibia–femur junction with a 2.0 mm grasping forceps (Storz). If there was macroscopic variation of synovitis, samples were taken from both macroscopically inflamed and macroscopically non-inflamed regions. The ST from all five control patients with meniscus pathology was obtained by arthroscopy with a 5.0 mm grasping forceps before the meniscectomy. On average, 20 ST samples from one knee joint were snap-frozen in methylbutane (–80°C) and used for tissue enzyme-linked immunosorbent assay (ELISA). Biopsy samples were stored in liquid nitrogen. On average, five ST samples from one knee joint were fixed in formalin and subsequently embedded in paraffin and then used for immunohistochemistry and in situ hybridization. ST protein extracts were prepared by mincing tissues in 2 volumes of extraction buffer [1% Tween 20, 1 M NaCl, 0.1% NaN3 in phosphate-buffered saline (PBS)], incubating the mixture on ice for 1 h and sonicating for 5 min in a water bath sonicator. After centrifugation at 10,000 g for 10 min, the supernatant was collected, diluted with 9 volumes of PBS and stored at –80°C or immediately assayed for protein concentration by the bicinchoninic acid assay (Pierce). Chemokine protein levels were quantified by sandwich ELISA with matched antibody pairs. ELISA plates (Costar) were coated with 100–400 ng per well of capture antibody [6217.11 for CXCL8 (R&D Systems, Minneapolis, Minnesota, USA); B8-11 for CXCL9 (PharMingen); 4D5/A7/C5 for CXCL10 (PharMingen); polyclonal rabbit antibodies against monocyte chemoattractant protein, for CCL2 (Endogen, Woburn, Massachusetts, USA); and 24006.111 for CCL4 (R&D Systems)] in PBS overnight at 4°C, blocked with block buffer [PBS containing 1% (w/v) BSA, 5% (w/v) sucrose and 0.05% NaN3] for 2 h at room temperature, and washed with wash buffer (0.05% Tween 20 in PBS). Samples (100 μl) and standards were incubated for 2 h at room temperature, washed, and incubated with 2 ng per well of polyclonal biotinylated antibodies against CXCL8 (R&D Systems) or CCL4 (R&D) or 20–400 ng per well of monoclonal antibodies 6D4/D6/G2 against CXCL10 (PharMingen), T-MCAF2 against CCL2 (Endogen) or B8-6 against CXCL-9 (PharMingen) for 2 h at room temperature. After washing, 0.1 ng/ml horseradish peroxidase-conjugated streptavidin (Zymed, South San Francisco, California, USA) was added for 20 min at room temperature, washed and developed with tetramethyl benzidine (TMB) peroxidase substrate (Kirkegaard and Perry Laboratories, Gaithersburg, Maryland, USA) for 20 min. The peroxidase reaction was stopped by the addition of 0.5 volume of 1 M phosphoric acid and the plate was read at 450 nm in an ELISA plate reader (Anthos, Durham, North Carolina, USA). Formalin-fixed, paraffin-embedded ST was cut into 5 μm sections and placed on slides coated with 2% 3-amino-propyltriethoxysilane (Sigma, St Louis, Missouri, USA). Immunohistochemical staining was performed with a monoclonal mouse antibody against CXCL8 (R&D Systems), as described previously [24,25]. In brief, we used alkaline phosphatase-conjugated antibodies (Dako, Glostrup, Denmark), napthol-AS-MX-phosphate, Fast Red Violet LB and levamisole (Sigma) for detection of the monoclonal antibody. All ST samples were processed in the same run. Negative control experiments were performed with irrelevant isotype control antibodies (X63 and FMC41) or normal donkey serum alone, or by leaving out the secondary antibody. A positive control (ST with known staining characteristics) was also used in each run. The cDNA used to produce CXCL8 riboprobes was obtained from Dr Phil Auron (Boston, Massachusetts, USA) and was restricted to 800 base pairs within the coding sequence. The generation of riboprobes was performed as described previously . The RNA copies were run off with a commercial riboprobe generation kit, which included digoxigenin-labeled dideoxyuridine triphosphate (Boehringer-Mannheim, Mannheim, Germany) as part of the nucleotide mix. Subsequently, paraffin-embedded tissue sections were processed as described previously . In brief, after washing steps with 0.2 M HCl and diethyl pyrocarbonate-treated water the sections were digested in proteinase K. After washing steps with SSC (0.3 M NaCl and 0.03 M sodium citrate, pH 7.0), sections were incubated with prehybridization solution. The prehybridization solution was replaced by a previously tested amount of labeled RNA anti-sense probe (or labeled RNA sense probe as a control). Sections were covered with coverslips, sealed with nail polish, and incubated overnight at 55°C. For visualization of the probes, sections were incubated with digoxigenin labeling solution and labeled with nitro blue tetrazolium and 5-bromo-4-chloroindol-3-yl phosphate. All sections were counterstained with hematoxylin. Slides were mounted in Aquamount (BDH Laboratories, Poole, UK) with a coverslip. One observer (MCK) performed the processing of all images. Five randomly selected high-power fields were chosen for the evaluation of each section, as described previously [27,28]. Each high-power field contained both intimal lining layer and synovial sublining. The high-power field images were acquired on a Olympus microscope (Olympus, Japan, Tokyo), and were captured with a CCD (charge-coupled device) three-chip video camera (Sony, Tokyo, Japan), and were digitized with a PV100 multimedia 16-bit color video digitizer card with a standardized macro program to both simplify and standardize the acquisition process. The resultant color images were in a 640 × 480 pixel RGB (red, green, and blue) format with a 24-bit resolution, enabling the use of 16,581,375 colors. For each acquisition session the microscope, camera, and computer were calibrated with a standardized procedure. The images obtained were stored as bitmaps without compression with a Zip disk and portable driver (Iomega, Roy, Utah, USA). All sections were examined with a Qwin (Qwin Pro V2.2; Leica, Cambridge, UK) computer-assisted color video image analysis systems. This system consisted of a PC with software. Two binary masks were applied with threshold values for the red, green, and blue channels. These thresholds were kept constant for all measurements with the same marker. A first binary mask identified the counter-stained areas as reference for the total region of tissue, and a second binary mask covered the positively stained areas. Both binary masks were processed individually to decrease the signal:noise ratio with erode, open, and dilate commands. Overlapping areas between the two binary masks were identified and they were not included in the analysis. Analysis was performed on the absolute area stained as indicated by the secondary binary mask. For the assessment of CXCL8 staining, the area was measured in pixels, the mean optical density was measured and the integrated optical density (IOD) was calculated by multiplication of the relative or absolute stained area by the mean optical density. Data were analyzed with the following nonparametric tests: Wilcoxon signed ranks test for matched pairs comparing CI knee joints with CU knee joints, and Mann–Whitney test comparing CU knee joints with control knee joints. Differences in chemokine expression between control, CI, and CU joints were screened by determining protein expression in synovial extracts. The CXC chemokines CXCL8, CXCL9, and CXCL10, and the CC chemokines CCL2 and CCL4 could be detected in rheumatoid ST. In three of the eight patients, CXCL8 expression was detected in the CU joint (0.1 ± 0.06 ng of chemokine/mg of tissue extract; mean ± SEM) and it was increased in the CI joint (0.3 ± 0.13 ng/mg), but CXCL8 was not detectable in the two control patients that were tested (Fig. 1). CCL2 expression was detected in five of six CU joints (0.9 ± 0.5 ng/mg), two of four patients showed increased expression in the CI joint (1.0 ± 0.2 ng/mg), and one of two controls had detectable levels (0.1 ± 0.0 ng/mg) (Fig. 1). CXCL9 expression was detected in four of the six CU joints (9.1 ± 8.3 ng/mg), two of four patients showed increased expression in CI joints (8.0 ± 2.7 ng/mg), and CXCL9 was not detectable in two controls (Fig. 1). CXCL10 expression was detected in two of the six CU joints (0.2 ± 0.2 ng/mg), whereas two of four patients showed increased expression in CI joints (0.4 ± 0.2 ng/mg), and CXCL10 was not detectable in two controls (Fig. 1). CCL4 expression was detected in three of six CU joints (0.1 ± 0.1 ng/mg); one of four patients showed increased expression in the CI joint (0.2 ± 0.1 ng/mg), and CCL4 was not detectable in two controls (Fig. 1). Differences between CI knees, CU knees and control patients were not statistically significant, possibly owing to the small numbers of patients. Chemokine levels in tissue extracts from clinically uninvolved (CU) compared to clinically involved (CI) joints in paired (connected, filled circles) synovial biopsies from eight patients with RA. Also shown are results from unpaired (open circles) synovial biopsies. Chemokine levels are expressed as ng/mg of tissue extract. To confirm and extend the observation that CXCL8 expression was higher in CI joints than in CU joints, immunohistologic analysis was performed. In one of the patients, the ST from the CI joint was not assessable. Expression of CXCL8 was observed in both the intimal lining layer and the synovial sublining (Fig. 2). There was markedly increased CXCL8 protein expression in six of the seven CI joints (IOD 65,961 ± 5364) compared with CU joints (IOD 28,552 ± 5749) (P < 0.05), whereas the eight CU joints showed similar results compared with the five control subjects (IOD 34,599 ± 5144) (Figs 3 and 4). Representative examples of synovial tissue sections stained for interleukin-8 (CXCL8) protein expression [immunohistochemistry, CXCL8 monoclonal antibody (mAb)] and CXCL8 mRNA expression (in-situ hybridization, anti-sense CXCL8 riboprobe) in normal synovium and in synovial tissue from paired clinically uninvolved knee joints and clinically involved knee joints of rheumatoid arthritis (RA) patients and control sections with a sense probe or aspecific mAb. 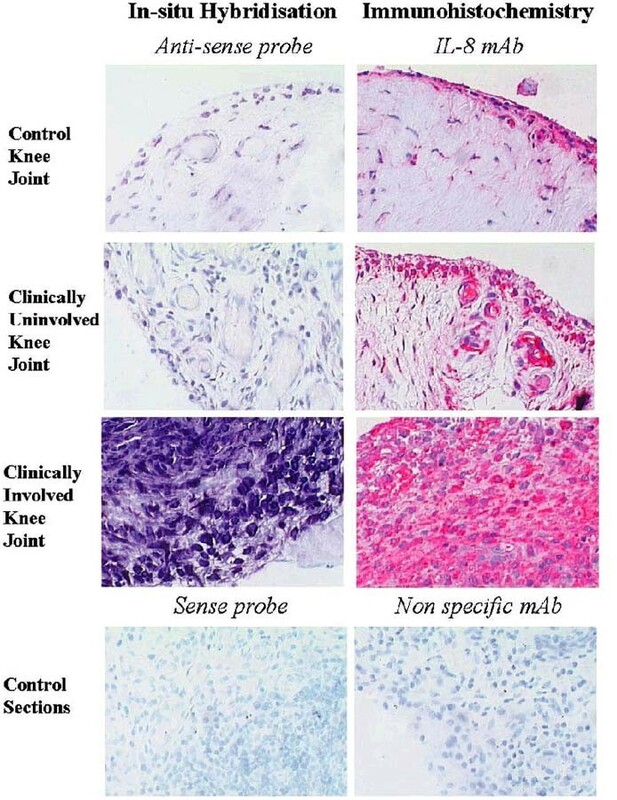 Mean integrated optical density (IOD) for interleukin-8 (CXCL8) protein expression (immunohistochemistry) and CXCL8 mRNA expression (in situ hybridization) in normal synovium and in synovial tissue from paired clinically uninvolved knee joints and clinically involved knee joints of rheumatoid arthritis (RA) patients. Abbreviation: ns, not significant. Interleukin-8 (CXCL8) expression and mRNA levels in synovial tissue (ST) from clinically uninvolved (CU) and from clinically involved (CI) joints in paired synovial biopsies from seven patients with rheumatoid arthritis (RA) (connected, filled circles). Also shown are results from one unpaired (open circles) synovial biopsy. CXCL8 levels are expressed as integrated optical density measured with digital image analysis on ST sections stained immunohistochemically and with in situ hybridization. 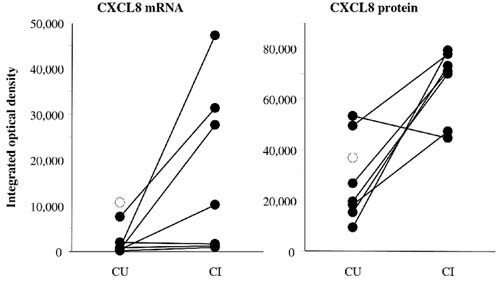 The increased expression of CXCL8 in CI joints compared with CU joints was confirmed by in situ hybridization to quantify CXCL8 mRNA expression. In one of the patients the ST from the CI joint was not assessable. CXCL8 mRNA expression in all seven CI joints (IOD 17,109 ± 6944) was specifically increased compared with the eight CU joints (IOD 2774 ± 1415) (P < 0.05) and the five control subjects (IOD 180 ± 66) (Figs 3 and 4). The values for CU and normal controls were essentially the same, as shown in Fig. 3. The results presented here show protein expression of the CXC chemokines CXCL8, CXCL9, and CXCL10, and the CC chemokines CCL2 and CCL4 in rheumatoid ST by tissue ELISA. CXCL8 protein levels were increased in CI joints compared with CU joints. Immunohistochemistry and in situ hybridization confirmed the results for CXCL8. Macrophages are major components of the inflammatory cascade involved in synovitis , and increasing evidence indicates that there is a distinct role for macrophage-derived cytokines in this process. Tumor necrosis factor-α (TNF-α) and IL-1β are important mediators of synovial inflammation and joint destruction [29,30,31]. In addition, the release of chemokines from inflammatory cells has a pivotal role in the development of inflammation [13,32,33]. The coordinated production of chemokines and proinflammatory cytokines is also important for the orchestration of the inflammatory response observed in patients with active RA [12,34]. 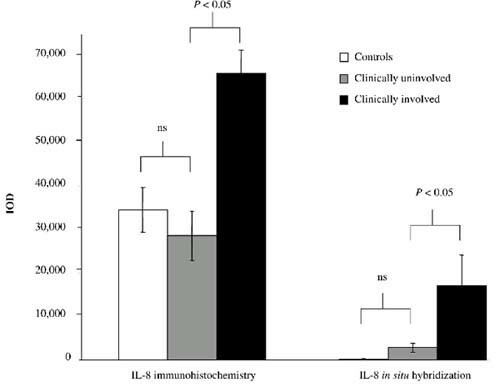 In RA, chemokines are involved in the infiltration of the synovium by leukocytes [12,35,36]. Chemokines such as CXCL8, CCL2, and CCL4 [12,37] are readily detectable in rheumatoid synovial fluid, and their expression is correlated with disease activity [38,39]. CXCL8 expression in rheumatoid ST is also associated with disease activity [39,40]. In addition, the chemokines CCL2 [18,35,41] and CCL4  have been detected in ST in RA. CXCL9 and CXCL10 are also abundantly expressed in RA synovium . The increased presence of the C–C chemokines CCL2 and CCL4 in both CU and CI knee joints compared with controls is consistent with the increased macrophage numbers present in both CU and CI knee joints . Both CCL2 and CCL4 are chemoattractants that act mainly on monocytes/macrophages and also regulate their expression of adhesion molecules [44,45,46]. We have previously shown that increased macrophage numbers can be found in CI as well as CU joints of RA patients . The CXC chemokines CXCL10 and CXCL9 were undetectable in control patients and expressed equally in CU and CI knee joints. Both are associated mainly with the attraction of activated T cells , which are thought to have a role in the pathogenesis of RA [47,48]. In line with our previous studies, the results presented here show no direct relationship between the number of T cells in the synovium and clinical signs of arthritis [7,8]. 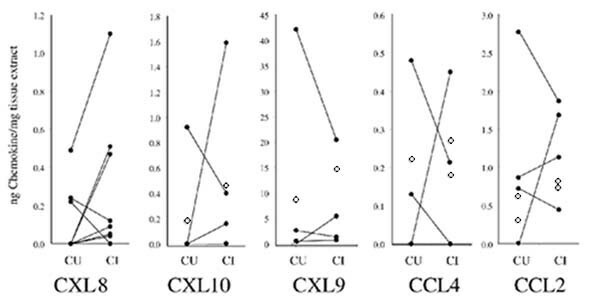 The observed difference in CXCL8 expression between CU and CI knee joints described here is a close reflection of the observations in animal models of crystal-induced arthritis where CXCL8 was the single factor determining the development of clinical signs and symptoms of arthritis [15,41,49]. Furthermore, neutralization of CXCL8-attenuated crystal-induced arthritis in an animal model  and RA patients treated with a high dose of methylprednisolone displayed a significant decrease in CXCL8 expression in ST biopsies together with an excellent clinical response . This phenomenon could be explained by the attraction of neutrophils towards the synovial compartment under the influence of CXCL8 [15,19,51,52,53,54]. Once neutrophils have arrived at the site of inflammation they are activated and contain a variety of proteinases and other enzymes, such as collagenase, elastase, gelatinase, myeloperoxidase, prostaglandins, and leukotrienes . They also release proteins such as fibronectin, and cytokines including IL-1β , TNF-α , and CXCL8 . Thus, the increased ingress of neutrophils into the synovial compartment and their prolonged lifespan  in response to CXCL8 might be important in the development of clinical symptoms, including swelling and pain. Therefore, targeting CXCL8 could be an effective anti-rheumatic treatment. This notion is supported by the observation that CXCL8 mRNA expression is decreased after treatment of antigen-induced arthritis . Specific inhibition of CXCL8 by therapy with monoclonal antibody has been shown to be effective in an acute model of arthritis . In RA patients, decreased CXCL8 production has been observed after treatment with methotrexate . Furthermore, treatment with corticosteroids results in decreased expression of CXCL8 in ST and CXCL8 levels in synovial fluid, decreased migration of neutrophils into the joint, and diminished arthritis activity [29,30,51]. Studies on the effects of specific targeting of CXCL8 in RA patients are not yet available. In conclusion, this study demonstrates the expression of CCL2, CXCL10, CCL4, CXCL9, and CXCL8 in ST of RA patients. Increased synthesis and expression of CXCL8 is associated with clinical signs and symptoms of arthritis. Future research should be directed toward elucidating which factors determine the specific upregulation of CXCL8 synthesis by macrophages in clinically inflamed joints of RA patients. We thank Leona P Whichard and Angela Parker for excellent technical assistance. This work was supported by National Institutes of Health grant AR39162.